A hurricane is a tropical cyclone (see below) in which the maximum average wind speed near a centre or eye exceeds 74 mph or 119 Km/h. The winds rotate in a counter-clockwise spiral around a region of low pressure. In the Atlantic and Eastern Pacific such systems are they are called HURRICANES. In the Western Pacific, including the Philippines - TYPHOONS, near Australia - WILLY WILLY and in the Indian Ocean - CYCLONES. The tropical cyclones are given names for easier identification and tracking. Tropical cyclone is the generic term used by the World Meteorological Organisation to define weather systems developing over tropical or subtropical waters in which winds exceed 34 knots or 63 km/h. Tropical cyclones also have a definite organised surface circulation. A warm sea temperature in excess of 26 degrees Celsius or 79 degrees Fahrenheit. High relative humidity (degree to which air is saturated by vapour). A location of at least 4 - 5 latitude degrees from the Equator. A weather system which gives rise to a specific area of cloudiness with embedded showers and thunderstorms. A tropical cyclone system with definite counter-clockwise wind circulation with maximum sustained winds of less than 38 mph (61 km/h). At this stage the system is given a number. A tropical cyclone system, with maximum sustained surface winds greater than 38 mph (61 km/h), but less than 74 mph (119 km/h). At this stage the system is given a name. A tropical cyclone with wind speed greater than 74 mph (119 km/h). The weather system is now better organised and the eye is well defined. The Saffir Simpson Scale is used to classify Hurricanes according to intensity. In this scale, hurricanes are classified into one of five categories as shown below. Tropical cyclones are characterised by their destructive winds, storm surges and exceptional levels of rainfall which may cause flooding. The strong winds generated by Tropical cyclones circulate clockwise in the Southern Hemisphere and counter clockwise in the Northern Hemisphere while spiraling inward and moving towards the cyclone centre. Winds speeds progressively increase towards the core. As the eye arrives, winds fall off to become almost calm but rise again just as quickly as the eye passes and are replaced by hurricane force winds from a direction nearly the reverse of those previously blowing. The rise in sea level above the normal tide. (See Table for Saffir-Simpson Scale). As the cyclone approaches the coast, the friction of strong on-shore winds on the sea surface, plus the "suction effect" of reduced atmospheric pressure, can pile up sea water along a coastline near a cyclone's landfall well above the predicted tide level. The high humidity condenses into rain and giant cumulus clouds result in high precipitation rates when the cyclone reaches land. The rain rapidly saturates the ground and rapid run off will result in severe flooding. Structures will be damaged or destroyed by wind force, storm surges, landslides and flooding. Public utilities such as overhead power lines, water and gas distribution lines, bridges, culverts and drainage systems are also subject to severe damage. Fallen trees, wind driven rain and flying debris can also cause considerable damage. There are relatively few deaths associated with the impact of high winds. 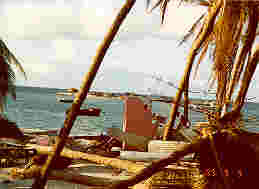 However, storm surges may cause many deaths but usually few injuries among survivors. The threat to public health emerges in the aftermath of events when conditions such as water contamination or shortages, flooding and damage to sanitation facilities may favour the spread of diseases. Communication may be severely disrupted as telephone lines, radio and television antennas and satellite disks are blown down. 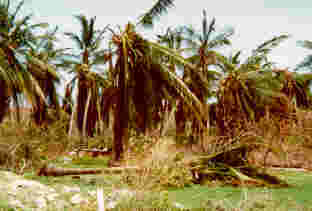 Roads and railway lines may be blocked by fallen trees or debris and aircraft movements are curtailed for hours after a cyclone. WEATHER WARNINGS - Who Warns? The local Meteorological Service, the National Disaster Organisation in association with the National Broadcast Media. Location (relative distance from prominent place). Provides information on the development and threat of a Tropical Depression which becomes a threat to land. The system is not named unless it is a Hurricane or Tropical Storm which has been down-graded to a Tropical Depression. Each new tropical depression is assigned a number, however. Issued when the wind speed of a tropical cyclone reaches 39 mph (63 km/h) or higher. Tropical Storms are given names. Advisory issued for a particular area when conditions are favourable for the development of a hurricane. It does not necessarily mean that a hurricane is imminent. Hurricane watches will be issued when Hurricane conditions are possible along the coast within 48 hours (instead of 36 hours which was previously used). Issued when hurricane conditions are expected to affect a particular area within 36 hours (instead of 24 hours). Continue normal activities but stay tuned to radio and television for further messages. Review emergency preparedness requirements, especially family emergency plans. Continue to listen to weather advisories on radio. Be ready to take quick action in case of a Warning. Stay tuned to the radio for information. Protect property and personal possessions (including important documents). Place indoors, loose objects found in and around the yard. Fill up car with gasoline. Pick fruit and trim trees if near house. Store water, food and essential medicines. Feed animals and pets and move indoors or loose. Know where you are going to shelter if the need arises. Assist in search and rescue. Seek medical attention for persons injured. Clean up debris and effect temporary repairs. Watch out for secondary hazards, fire, flooding, etc. Assist in community response efforts. The evaluation of risks of tropical cyclones should be undertaken and illustrated in a hazard map. The following information may be used to estimate the probability of cyclones which may strike a country. Analysis of climatological records to determine how often cyclones have struck, their intensity and locations. History of winds speeds, frequencies of flooding, height location or storm surges. Information about 50-100 years cyclone activity. This is designed to control land use so that the least critical facilities are placed in most vulnerable areas. 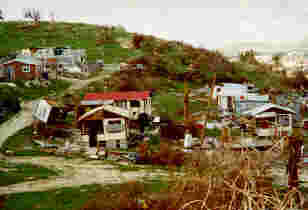 Policies regarding future development may regulate land use and enforce building codes for areas vulnerable to the effects of tropical cyclones. A master plan for flood plain management should be developed to protect critical assets from flash, riverine and coastal flooding. New buildings should be designed to be wind and water resistant. Design standards are usually contained in Building codes. Communication and utility lines should be located away from the coastal area or installed underground. Improvement of building sites by raising the ground level to protect against flood and storm surges. Protective river embankments, levees and coastal dikes should be regularly inspected for breaches due erosion and opportunities taken to plant mangroves to reduce breaking wave energy. Improved vegetation cover. This helps to reduce the impact of soil erosion and landslides and facilitates the absorption of rainfall to reduce flooding.